So how is a Verruca treated? There are no right answers when treating a verruca, there are lots of home treatments and lots of treatments that podiatrists like to use, but no single treatment stands out as the most effective. What if I have tried all of these elsewhere and they haven’t worked for me? Once all other conservative measures have been tried and the verruca is still present after two or more years then it is worthwhile trying electrosurgery. Electrosurgery is carried out under local anaesthetic by a podiatrist specially trained in electrosurgical techniques using a special surgical unit. An electric current is sent down a small probe which is responsible for the evaporation of the cell contents and destruction of the virus-containing tissue on the foot. For more information on this subject follow the link for Verruca Surgery. What are the benefits of seeing a podiatrist at Bartholomew Way Clinic about my verrucae? Diagnosis: Examination is worthwhile for peace of mind. Are you sure it’s definitely a verruca? It is therefore important to rule out more sinister skin conditions. Experience: All four of the podiatrists have treated a large number of verrucae over the years in an effective and pain free manner. We know what works and what doesn’t. We know what treatments work with different types of verrucae. We definitely know what one looks like. Results: We have great results in reducing the size and pain of verrucae. We often recommend a course of three intensive treatments of cryosurgery to reduce the verruca in size. Alternatively we may simply offer advice and support for you to self-treat the verruca more effectively at home, with reviews and monitoring appointments. Return appointments to reduce the verruca periodically are often worthwhile. As mentioned in ‘treating a verruca post’ if conservative care fails then electrosurgery may be indicated. 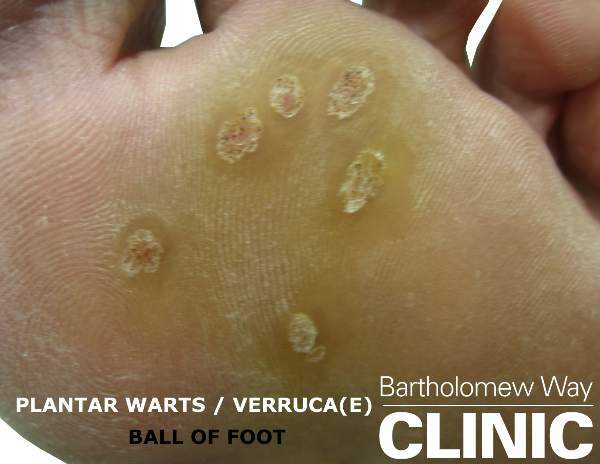 Verruca or Wart? What is this on my foot?